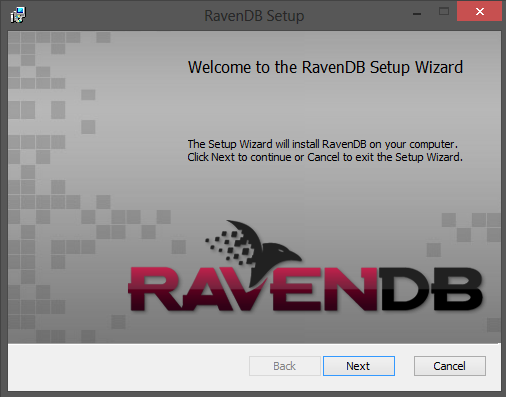 Since version 2.5 the installation of RavenDB can be accomplished by using a GUI installer. The setup wizard will guide you through an installation process where you just need to select the type of an installation and provide configuration options. Development - no license is required. 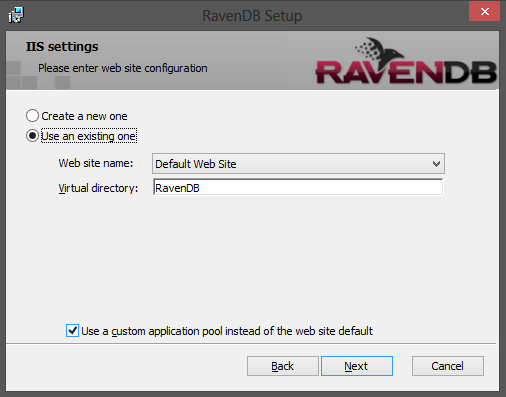 You can install the RavenDB either as a Windows service or as IIS application. Next steps will guide you through a configuration of a chosen deployment strategy. 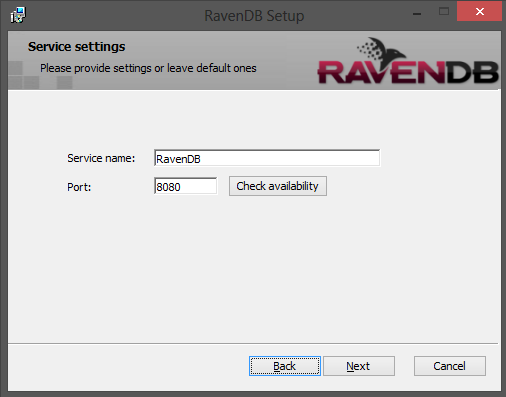 The configuration of the RavenDB service is straight-forward. You only have to provide the name and the port number of the service. The configuration of RavenDB run on IIS requires you to go throught a few screens. The Virtual Directory field can be empty. 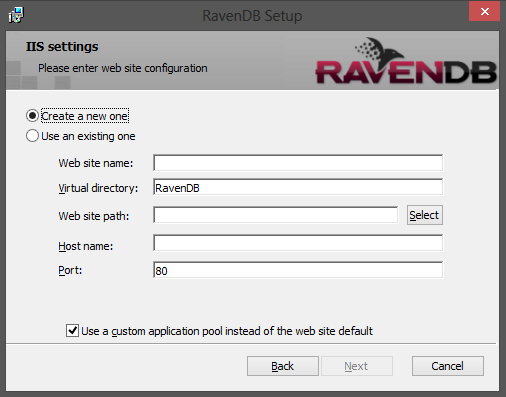 Then it means that RavenDB will be installed at the root of the web site. 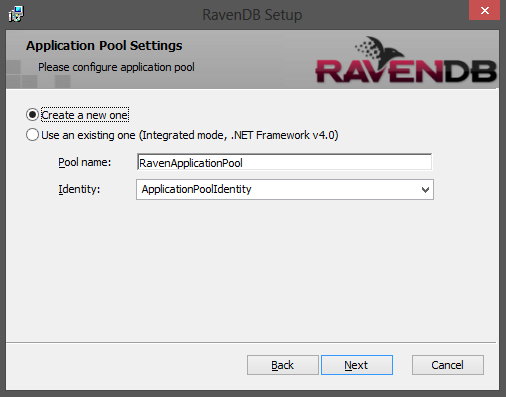 Optionally you can select a checkbox to configure a custom application pool for RavenDB application instead of using the default one configured for the web site. This optional dialog (shown when the checkbox on the previous screen was selected) allows you to set up a custom application pool. As previously you can either create a new or use an existing one. The next screen is to configure permissions of the application pool user to the performance counters access. 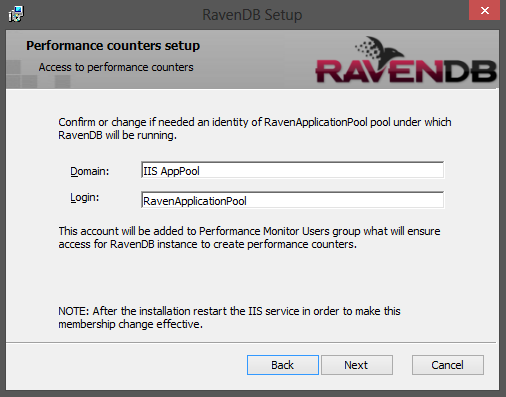 This is needed to ensure that RavenDB hosted by IIS will be able to create own counters and provide performance stats there. The RavenDB installer supports upgrades. The previously used settings (like a service name or an installation path) will be recovered by the wizard. The installation process first will automatically remove the old version and then will install the new one. Uninstallation can be accomplished by Programs and Features in Control Panel . Only the files created during an installation process will be removed, so all of database data will remain untouched on a disk. ravendb-[version].exe /quiet /log C:\Temp\raven_log.txt /msicl "RAVEN_TARGET_ENVIRONMENT=DEVELOPMENT TARGETDIR=C:\ INSTALLFOLDER=C:\RavenDB RAVEN_INSTALLATION_TYPE=SERVICE REMOVE=IIS ADDLOCAL=Service"